A super thumbnail with a very sharp, lustrous Anatase estheticly perched on matrix. In fine condition as seen, there is one minor contact on a backside but no damage. Norwegian Anatase are some of the best in the world and are now classics. Choice. 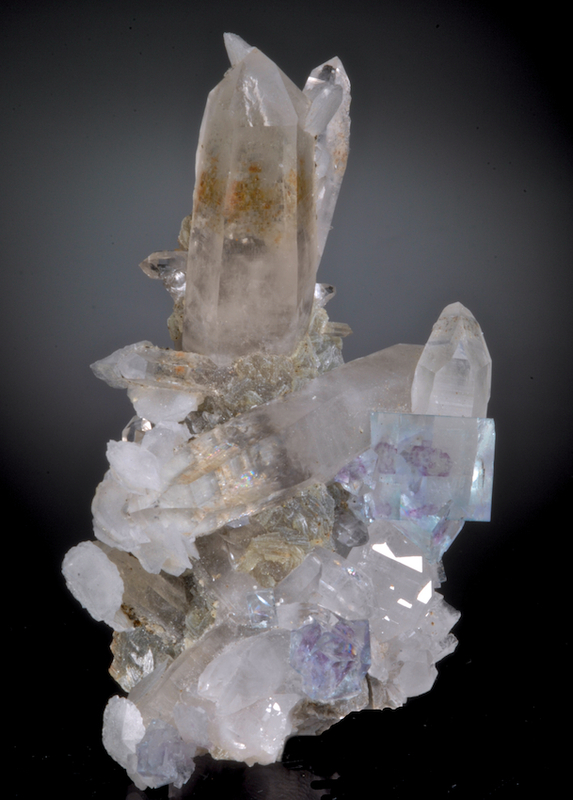 An impressive Yaoganxian specimen with gem clear Zoned/ phantom Fluorites scattered on sizable clear Quartz crystals. Ex Charles Noll collection, an older specimen. Very 3-dimensional with top quality color and sharpness for the Fluorites. The backside and base of this are contacted and broken where it was removed which can not be seen on display. The display side is in impeccable undamaged condition which is rare. One of the worlds top mineral locales, Yaoganxian now produces almost nothing, this type of quality is only found in older collections. 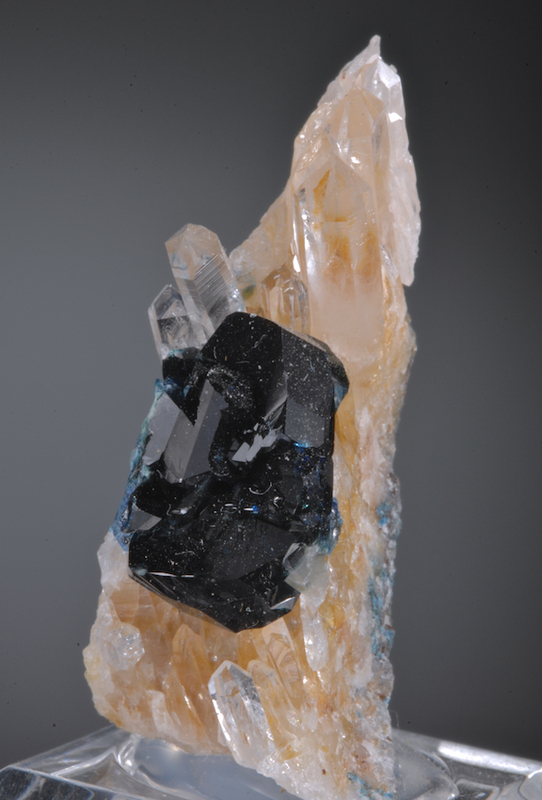 Bright and sharp Lazulite crystal cluster perched on a Quartz crystal matrix from Rapid Creek. This zone in the Yukon has produced some of the most incredible Lazulite crystals on earth, with this type of deep indigo blue color and shining luster. A nice example, some contacts on one back edge but displays well without that being seen. A lot of display impact for the size and a good value. 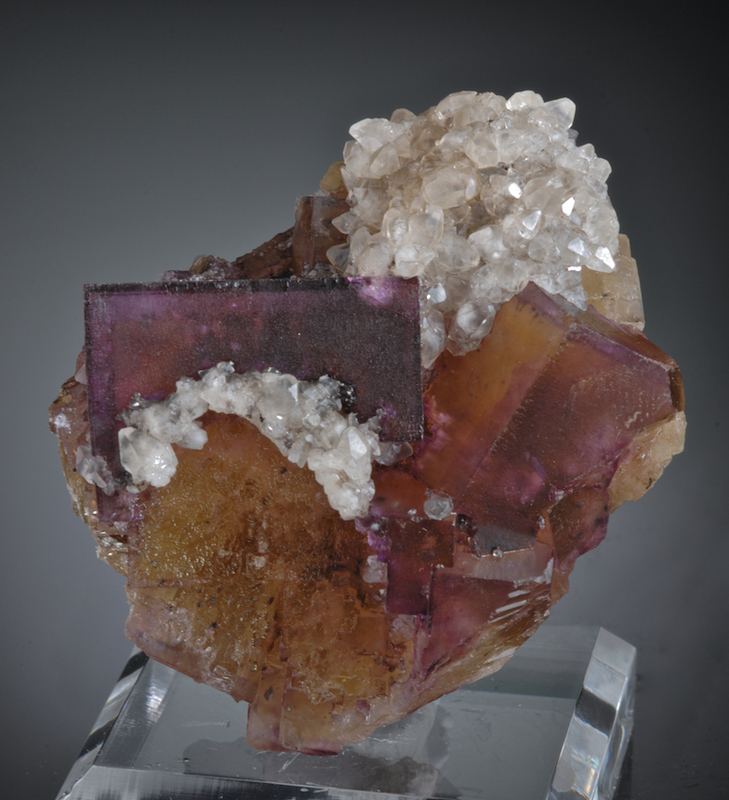 A classic Cave in Rock Fluorite with yellow and orange cores and purple outer zoning. Some well defined etching and pitting contrasts well with the sharper corners and edges. The Calcites are distinctive of the Annabelle Lee mine, and quite a nice esthetic addition. The condition of the display face is very good the only damage or contacting is the outer edges and backside where this was removed. A lot of good display impact for the size. Choice Fluorites of this quality are fast becoming very very expensive. As the mines have now been closed for decades, there will never be more of these and only turn up in older collections. 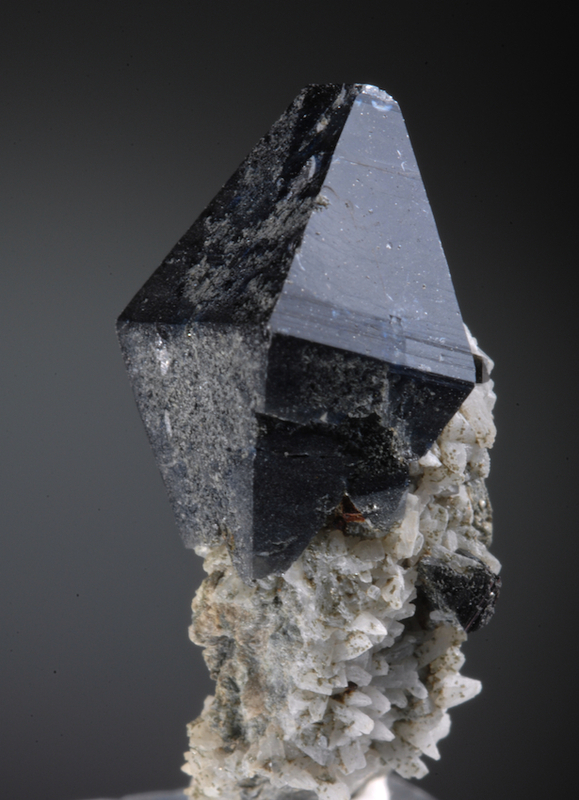 An excellent Apatite crystal cluster from the older finds at the Sapo mine. Far better than most that came out, The color and luster and condition are first rate. These amazing but odd habit Apatites have had many names (Crullers, Snakes, Tubes, Medusas etc) and are fantastic examples of epitaxial growth; These have prisms in a chain or parallel growth that is built around a hollow tube composed of many stacked crystals. A really fine, textbook quality specimen in excellent condition. There is a separate smaller branch growth and very good transparency, color and luster on this. No damage or repairs which is rare in any piece of this size, this is even better in person, to me this is a real mineralogical marvel. A remarkable classic with documented history. A very old Chessy Les Mines piece, from the collection of Wallace Gould Levison, which he obtained in 1865 from mineral dealer Chas. S. Stone of Brooklyn NY. We include for the buyer a photocopy of the handwritten journal entry for this piece. 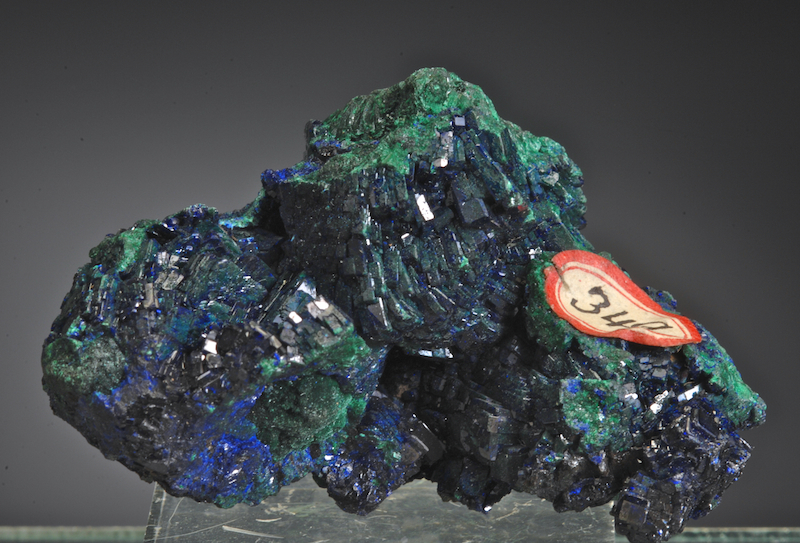 Aside from the early vintage, the specimen is quite fine in its own right, well crystallized with rare electric blue color and clustered bladed rosettes. While not critically perfect, The condition is impressively good despite a century and half of handling. Most of what at a glance look like bruises are in fact undamaged. In 1865, 15 years before Bisbee began to produce these were treasured as the worlds best Azurites. This is still a nice specimen with very good luster and form. 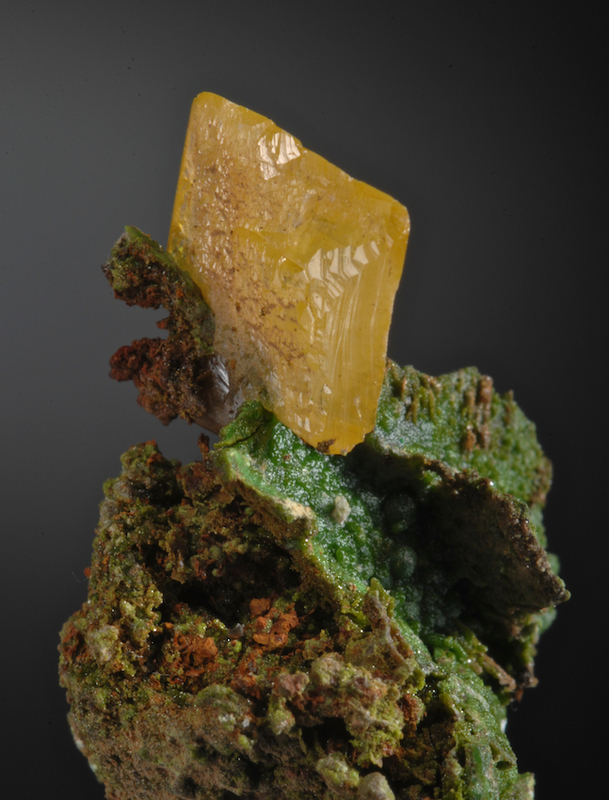 A superb, sharp yellow Wulfenite crystal perched on a delicate matrix of bright green Duftite balls and related minerals. Great combination with wonderful color and in exceptional condition. With 20 x magnification I can just see one very microscopic bruise point that is impossible to find otherwise. Choice display specimen that has fine form and color contrast. 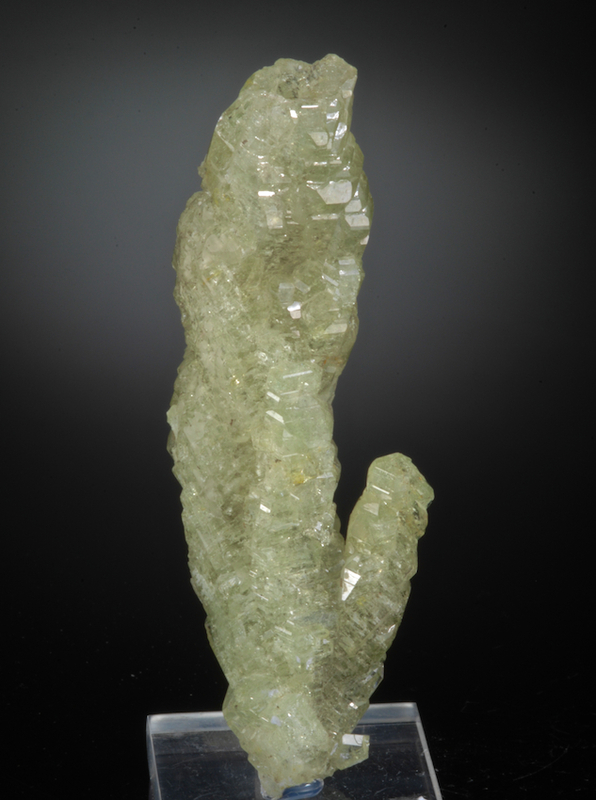 A complete, sharp transparent alpine style Apatite prism loaded with Byssolite needles that give the transparent colorless crystal a deep green hue. 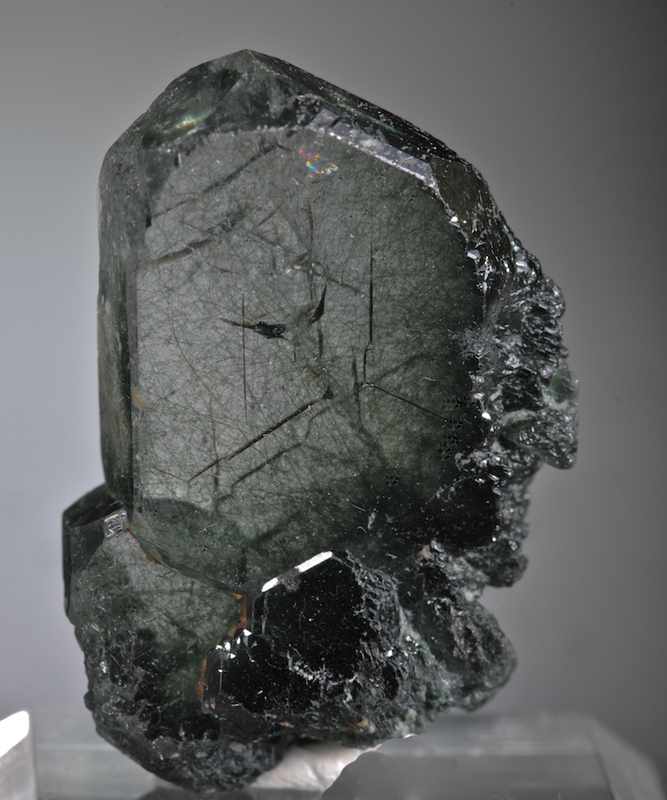 Very similar in form and look to Austrian and other European cleft Apatite. There is no damage and the whole is a floater with no point of attachment. Some of the edges show very complex multi faced crystallization and a few conjoined smaller crystals.